In April 2014, following discussions with the Tongan Red Cross Society, MAMA looked at opportunities to provide more diverse education and socialisation opportunities to children and young people with a disability in Tonga. A recent census in Tonga identified that 7,271 people have a disability, which represents 5% of the population. Social stigma around identifying as having a disability means that figure is likely to be under-reported. People with disabilities are among the most vulnerable groups of people in developing countries. They often lack a voice in public discourse, and their interests and needs are often neglected. Attitudinal and environmental barriers to the participation of people with disabilities in education and work prevent their inclusion in social and economic life. This has a profound social and economic effect on individuals with disabilities, who are excluded from livelihood opportunities by negative attitudes, and can find it difficult to find work when they have not attended school or training. It also has a significant impact on family members, who often forego employment to stay at home and provide care. The exclusion of children with disabilities from school and stigma which keeps children with disabilities at home under the care of relatives reinforces and exacerbates the poverty experienced by people with disabilities and their families. It is likely that the vast majority of young people with disabilities, particularly outside of Nuku’alofa, are not in school as limited provisions are made for their inclusion. The notion that a person with a disability cannot learn is a commonly held belief, which means parents may not prioritise education for children with disabilities. 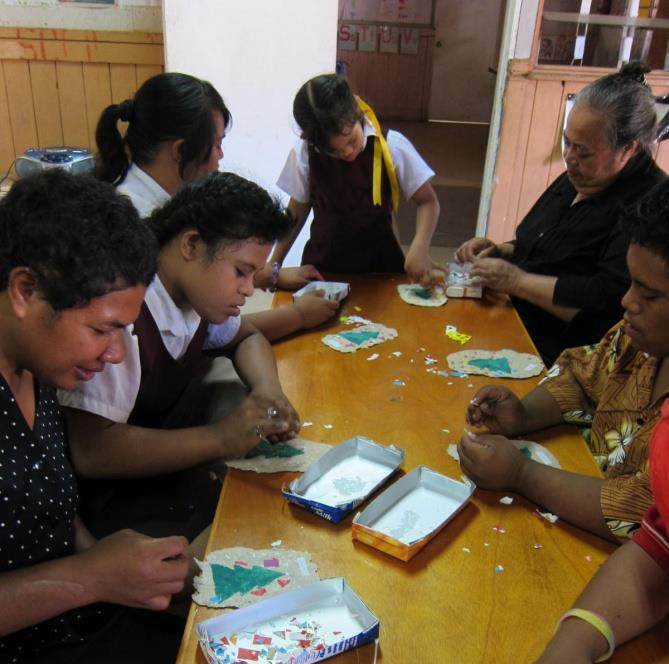 Currently the Ofa Tui Amanaki (OTA) Centre operated by the Tongan Red Cross Society provides one of the only options for education for children with disabilities in Tonga. An external review completed of the OTA Centre in February 2011 found that the Centre provides an important service by providing a safe space for children and young people with disabilities and teaching some basic daily living skills. It identified significant additional resourcing was needed to strengthen the educational outcomes of students at the Centre and increase the capacity of the current teaching staff. After liaising with the Australian High Commission in Nuku’alofa, MAMA partnered with the Tongan Red Cross Society to fund vocational programs and infrastructure improvements at the OTA Centre. This project will improve the quality of teaching materials and resources that are so important to enable teachers to offer interesting and engaging activities for students; and will implement skill-building programs for students over 18 years of age at the Centre. There are limited options for young people with disabilities to receive further education, either vocational or academic, once they leave the OTA Centre or other schools. As a result many of the students attending the Centre are aged in their twenties. The lack of vocational training limits the extent to which people with disabilities can reach their potential and contribute economically to their families and communities. improve the safety and quality of the premises by repairing existing infrastructure. The outcomes of strengthening the OTA Centre will extend well beyond the life of the project. Through structured capacity development opportunities, the teachers at OTA will learn and begin implementing effective approaches to teaching children with disabilities. The benefits of children with disabilities receiving a high quality education will also continue well beyond the life of the project, as they use the skills developed at OTA to lead more satisfying and productive lives. Children learning at the Ofa Tui Amanaki Centre.